The word "dross" just doesn't describe the inanity of this article. Just curious but has anyone else actually heard of her? This could be some random person off the street for all I know. To be fair, yes I have heard of her - she's an actress most recently famous for starring in Drive Angry with Nicolas Cage. 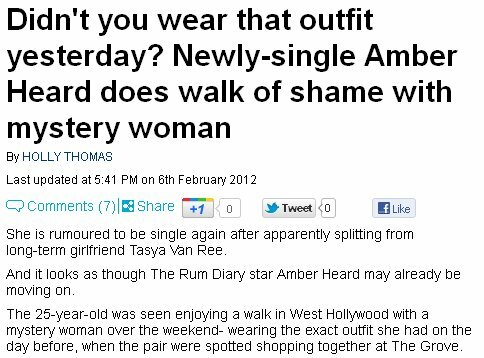 She also came out as bisexual a few years back, which probably explains why the Mail is so interested in following her - that way, they can "speculate" about anyone she's seen with, male or female. Proud of this high quality journalism. PROUD, I says. 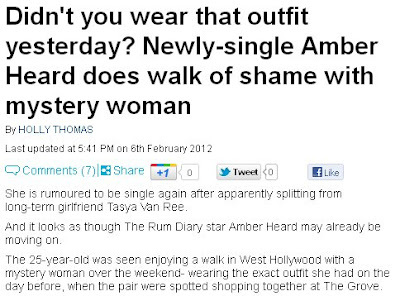 Looks like the Daily Mail has done the Walk of Shame as the story has disappeared. err who is this woman? And do I really care if she wears the same dress more than once.